More than any other topic of discussion, the locals I met in Puerto Maldonado kept bringing up a single problem they faced in maintaining the Amazon forest - illegal gold mining. I thought it important to pass along the information I was given in this post. My first introduction to this epidemic came on my flight into Puerto Maldonado. I was happily gazing out the plane window onto the tropical rainforest below as I thought about all the activities I'd do on this visit. Muddy orange rivers meandered through the forest like lazy snakes who couldn't decide which way they wanted to go. Then the man next to me pointed out several bald spots in the green, telling me they were mostly the result of illegal gold mines. Does anyone else find it appalling that you can see the impact of this work so easily from a plane window? While the Peruvian government does allow some gold mining in the area, a lack of resources to regulate illegal mining has turned this trade into a free-for-all. Droves of men from other parts of Peru (I heard most of them come from Cusco) will come to Puerto Maldonado to make their riches here. The pay is huge but miners risk their lives in unsafe conditions. According to an article by Business Insider, the illegal mining trade boomed in 2008 with the crash of the global economy, causing the price of gold to skyrocket. 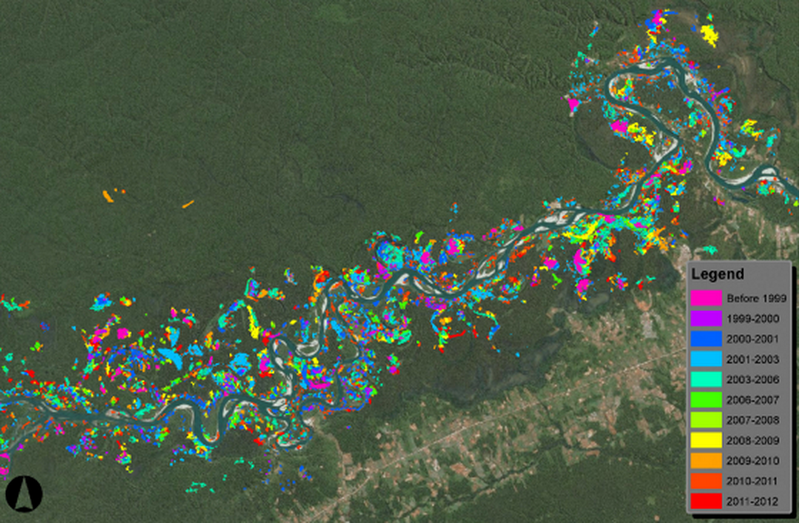 The graphic below shows how much the mining industry has grown over the years along one river, the Madre de Dios. This is an important graphic because of the way in which the data was collected. New laser imaging technology allowed the scientists to uncover mines more accurately than earlier attempts, which mostly relied on visual sightings. And because of this, they're now aware of many more mines than previously thought. Not only do the miners blast away the forest to reach the gold underground, they use mercury to purify the gold, which contaminates the water supply. Just from talking to people, though, I could hear some ambivalence toward taking action. Gold mining has clearly left a positive impact on the local economy and there are too many winners for the government to take a harder stance. Corruption and bribery also play their part to prevent reform. One person I met here talked about his friend, a man from Cusco who moved to this city to be an accountant for the miners. In a conversation he had with this friend, he recalled saying, "Yeah, you earn a lot of money working for these people but you have to think about where the money's coming from." To which his friend replied simply, "I know." 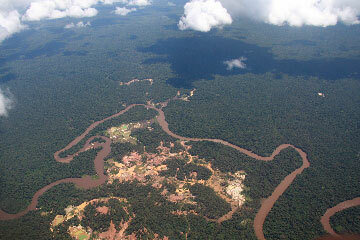 Kelly Dickerson, "How Gold is Destroying Peru's Rainforests", businessinsider.com, November 1, 2013.